�From: North. Take State Route 16S turn right onto State Route 417W for 3 miles, the Best Western Plus University Inn is on the left. �From: South. Take State Route 16N turn left onto State Route 417W for 3 miles, the Best Western Plus University Inn is on the left. �From: East and West. 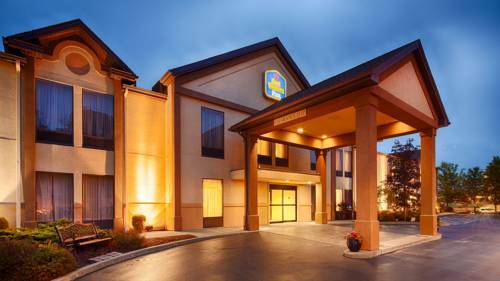 Take Interstate 86, Exit 24, turn left onto State Route 417E for 2 miles, the Best Western Plus University Inn is on the right. 0.30 mile(s) from Ponderosa, American, Monday - Saturday 11:00 a.m. to 10:00 p.m. Sunday 8:00 a.m. to 10:00 p.m.
2.50 mile(s) from Century Manor, steak/seafood, Sunday - Friday 5:00 p.m. to 10:00 p.m.
Across the street from Lakeview Chinese Restaurant, Chinese, Monday - Thursday 11:00 a.m. to 10:00 p.m. Friday - Saturday 12:00 Noon to 10:00 p.m. Adjacent to Applebee's Neighborhood Grill & Bar, Monday - Saturday 11:00 a.m. to 12:00 Midnight, Sunday 11:00 a.m. to 10:00 p.m.
2.00 mile(s) from Beef N Barrel, American, Monday - Saturday 11:00 a.m. to 10:00 p.m.